It's not uncommon to catch something small and dark scurry across your floor or fly in front of your face while you're enjoying a relaxing movie or cooking dinner for your family. Various types of insects -- and other arthropods -- inhabit your home with you and some can become serious pests. Pantry pests get this common group name due to their preference for pantry products in the home. Most pantry pests are beetles, although a few other types of insects make their way into this group as well. 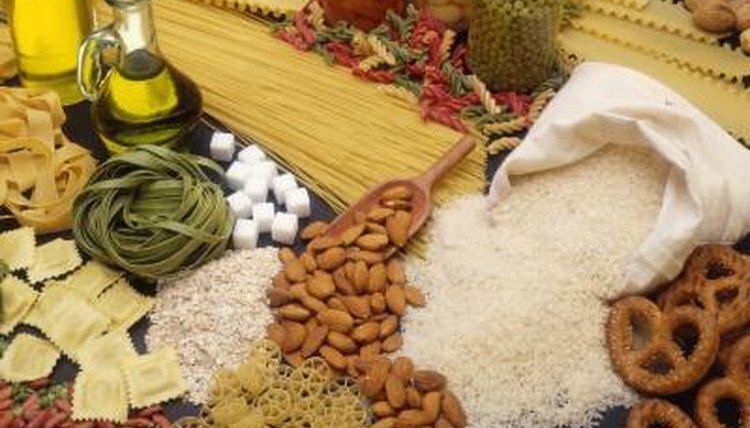 Common preferred foods of these pests include flour, pasta, spices, dried fruits, nuts and cured meats. The larvae of Indian meal moth (Plodia interpunctella) spin silk webs near their food source, sometimes under the lids of spice containers or in bags of coarse flour. The adults are small moths. Other pests include various beetles including dermestid beetles (Dermestidae sp. ), grain beetles (Oryzaephilus surinamensis), flour beetles (Tribolium spp.) and drugstore beetles (Stegobium paniceum). Few insects garner the attention and downright disgust that cockroaches do. American (Periplaneta americana), German (Blattella germanica), oriental (blatta orientalis) and brown-banded (Supella longipalpa) cockroaches are common species. The German and brown-banded cockroaches are the two most frequent house pests; American and oriental cockroaches prefer outdoor habitats but make their way inside on occasion. All four of these species have somewhat elongated yet stout, cylindrical bodies, powerful, long hind legs and very long antennae. Prevalent in many homes across the nation are blood-sucking pests. Bed bugs (Cimex lectularis) are tiny, oval-shaped insects that reach about 1/5-inch long. They're most common in bedrooms and sometimes living areas. Fleas are a common occurrence, particularly with people that have furry pets. These small jumping insects can quickly reach outrageous numbers. Several types of fly inhabit homes during different times of the year. House flies (Musca domestica) are the most common household fly pest. Blow flies (Calliphoidae spp.) are shiny, metallic flies. Vinegar flies (Drosophila spp.) are typically shorter than 1/8-inch; they have red eyes. Moth flies (Psychodidae spp.) are small, hairy flies that prefer moist areas and are sometimes called drain flies. Fungus gnats (Mycetophilidae spp. and Sciaridae spp.) are very small creatures that resemble tiny mosquitoes. Asian lady beetles, paper wasps, stink bugs and assassin bugs may also make their way into homes, typically in late autumn as they're searching for a warm, safe place to overwinter. Common, noninsect household arthropods include silverfish, house centipedes, various spiders and pill bugs.